The motto of celebrating World Rabies Day is to raise awareness about rabies prevention and to highlight the progress of defeating the disease, every year. Rabies Day celebrated on 28th September. It also marks the anniversary of Louis Pasteur’s death, a French chemist, and microbiologist developed the first rabies vaccine. Rabies is an incurable disease that mainly causes inflammation to brain and eventually death. Rabies Day, celebrated annually with a theme. For this year the theme is Rabies: Educate, Vaccinate, Eliminate. It emphasizes on two crucial points that the communities can do to prevent rabies. It also reflects to eliminate human deaths due to dog-mediated rabies by 2030. Rabies is caused by the bite of a dangerous and an infectious animal such as dog or bat. The problem with Rabies is that it does not show any symptoms immediately. You should take Vaccine within 48 hours of dog bite. Rabies present in nerves and saliva of infected animal. The symptoms of Rabies initially feel influenza, which includes fever and tingling at the site of the bite. After few days, the person may develop violent movements, fear of water (hydrophobia), and inability to consume food, confusion, and loss of consciousness and even urge to bit others. The two founding partners celebrated the first World Rabies Day, i.e., Alliance for Rabies Control (ARC) and Centre for Disease Control and Prevention, Atlanta (CRC) in the year 2007 on 28th September with co-sponsorship by World Health Organisation (WHO). 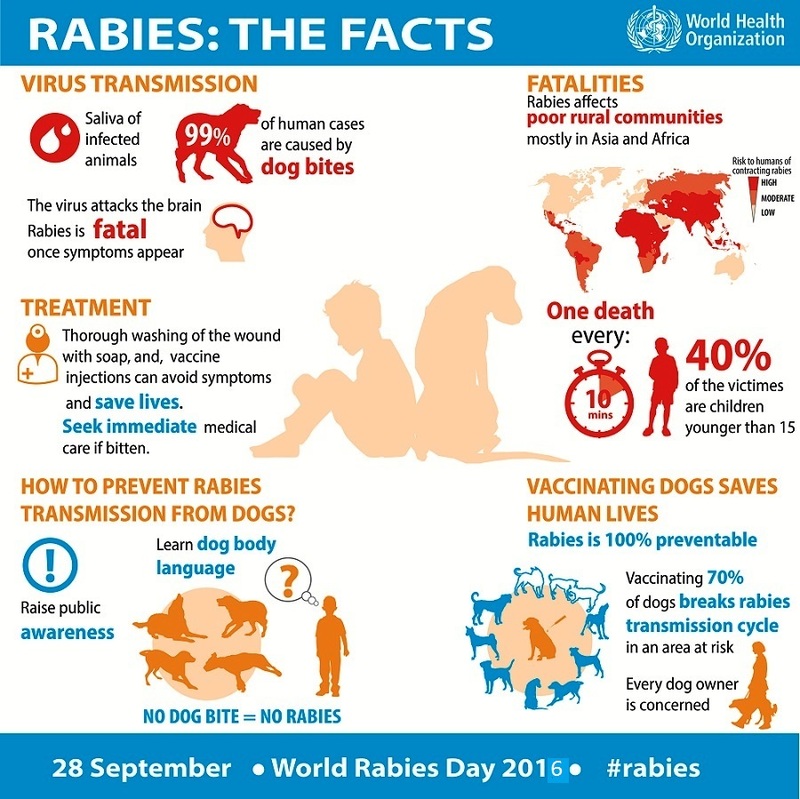 The overall aim of World Rabies Day is to bring awareness about the impact of human and animal rabies; it’s easy prevention and how to eliminate the disease. Many government agencies and disease control centers that support World Rabies Day distributes medical kits, including posters, pamphlets to increases awareness and prevention of rabies. In India, rabies is mainly caused by non-vaccinated stray dogs, while in countries it is mainly caused by bats so far. This disease causes nearly 55,000 deaths annually. Therefore an effective vaccination is necessary to counter and the threat of preventing rabies. Viewers can find the World Rabies Day Quotes from here.